In 2059, Scion has taken over most of the world’s cities, promising safety for all the citizens it deems worthy and wiping out clairvoyants wherever it can find them. Paige Mahoney, though, is a clairvoyant–and a criminal just for existing. Paige is determined to fight Scion’s power, and as part of the Seven Seals, Paige has found a use for her powers: she scouts for information by breaking into others’ minds as they dream. 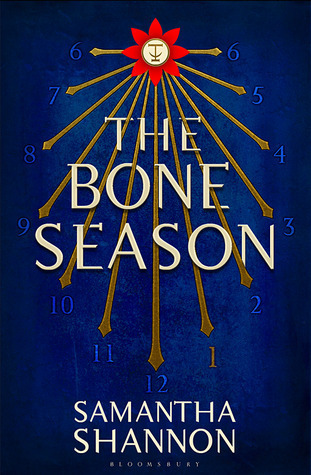 The Bone Season by Samantha Shannon is the first book in the young adult science fiction fantasy series by the same name. Set in an alternate version of England in the not too distant future this one takes a look at clairvoyancy. Paige Mahoney is a clairvoyant in a world in which her power makes her a criminal. With having no choice in what to do with her life already being wanted Paige took a job with the Seven Seals using her power to gain information in the fight against Scion that controls the world. However, Paige ends up captured and sent to a prison in another city controlled by the Rephaim. It’s here where Paige ends up the property of Warden but Warden is unlike other masters and agrees to begin training Paige instead of treating her like other slaves. Obviously from my rating this one just wasn’t my cup of tea at all. There were two huge factors to that feeling with one being I never really cared for Paige at all throughout the story. It’s basically one of those reads where she’s has that super special ability and ends up wanted for it but darn the girl had attitude making me root against her instead of for her. And then of course you all may know what else is coming…. it’s just too darn long and drawn out for my taste. One note I made being it took almost 200 pages just to explain what a bone season was. If a slower paced read with complex world building sounds good though you may want to give this series a shot. Samantha Shannon was born and raised in West London. She started writing in abundance when she was twelve, started her first novel when she was fifteen, and studied English Language and Literature at St Anne’s College, Oxford, from 2010 – 2013, graduating with a 2:1. In 2013, she published The Bone Season, the internationally bestselling first installment in a seven-book series of fantasy novels. Its first sequel, The Mime Order, was published in 2015, and she’s currently editing the third book in the series, The Song Rising. She is also working on a high fantasy novel. Film rights to the Bone Season are held by the Imaginarium Studios, Chernin Entertainment and 20th Century Fox. Note: I don’t generally answer messages on Goodreads, but please feel free to contact me on Twitter (@say_shannon), Tumblr (sshannonauthor), or my blog. Nice review! I’ll add it to my TBR. I know many people have liked this one, but I am not a lover of long tomes that don’t have much going on either. I guess it is not for everyone, but for those who enjoy it, it is a great one. Whoa! Two stars? I’ve had this and the other books on my tbr forever, but I think I’ll cross them off now as I don’t like annoying main characters.